During the day, episodic memories (memories for events) are stored in the hippocampus, a region of the brain specialized for long-term memory that learns particularly quickly. At night, memories from this region appear to be transferred to the cerebral cortex, the region specialized for information processing, cognition, and knowledge. 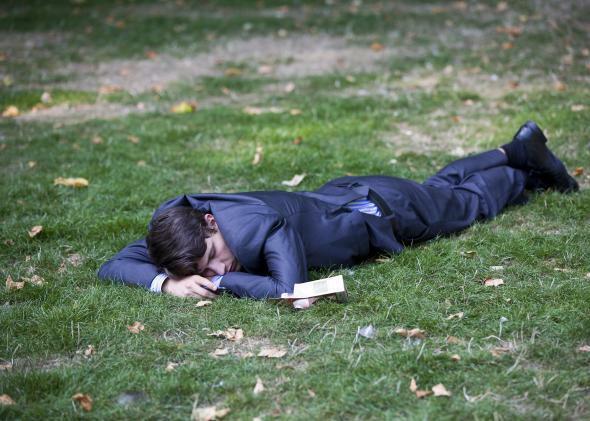 A businessman sleeps in the shade in a park in central London. What might he be dreaming about? Studies in animals have found that during sleep, the neural activity of the hippocampus “replays” the events of the day. This replay happens faster than real-time, and sometimes happens in reverse. The activity replay is correlated with neural activity patterns in both the visual cortex (responsible for visual experience) and the prefrontal cortex (responsible for strategy, goals, and planning). The memory replay occurs during REM sleep and dreaming. The secret is that while the Dream Guesser is out of the room, everyone else is told to answer yes/no questions according to a rule (for example, “yes” if the question ends in a vowel, otherwise “no”). When the Dream Guesser returns and the increasingly bizarre yes/no questions ensue, it becomes apparent that the “dream” is being created by the Dream Guesser in response to “random” answers. Could the bizarreness of dreams come from the brain’s attempt to make sense of internal signals generated during memory consolidation, as the “activation-synthesis” model of Alan Hobson (Harvard) suggests? Dream interpretation often assumes that dreams are coded in terms of symbols, motivations, and beliefs that are meaningful to the dreamer. This coding is what one would expect if dreams were generated by a systematic review of memory relative to personal life strategy. If we imagine that the memory consolidation process is not random, but instead focuses on conflicts between past experience and biologically determined goals, then it should not be surprising that motivational tensions surface in dream content. Stickgold et al (2001) propose that the emotional features of dreams “reflect an attempt, on the part of the brain, to identify and evaluate novel cortical associations in the light of emotions mediated by limbic structures activated during REM.” In other words, the brain is trying to interlink our experiences of the world with our emotional drives. Dreams may also allow the brain to explore hypothetical situations in some abstract way in order to refine action strategies for use in the future. The imagery of dreams may result from the brain’s sense-making machinery processing signals generated by internal motivational systems, unconstrained by sensory input. In other words, dream imagery could be one part of the brain trying to make sense of the “internal test patterns” generated by another part of the brain. Neuroscience: What part of our brain generates dreams? Why do I sometimes confuse memories of dreams with memories of reality? What determines which language I dream in? Evolutionary Biology: What is the evolutionary advantage of dreaming? Philosophy: Is there such a thing as the subconscious? What are good ways to remember dreams? Why aren’t there smells in dreams? Why are dreams difficult to remember?